Russian Ambassador to the US Anatoly Antonov said that Washington pursues "the illusory idea to achieve global military dominance"
WASHINGTON, February 9. /TASS/. The United States aims at breaking down the existing architecture of arms control while pursuing an illusory goal of achieving global military dominance, Russian Ambassador to the US Anatoly Antonov said commenting the situation around the Intermediate-Range Nuclear Forces (INF) Treaty. The ambassador reminded that Russian President Vladimir Putin already "gave clear directions to the defense ministry in regards to protecting national interests, preventing the disruption of strategic parity." "Russia's measures are not costly, they do not envisage an arms race but at the same time allow to maintain the military-strategic balance," Antonov said. Washigton's actions are especially dangerous because they affect strategic stability as a whole, not only in relations with Moscow, the ambassador noted. "Russian-US relations in this field always determined the vector of strategic stability, were considered by other states when they were developing their security policies, served as a guideline in strengthening the non-proliferation regime," he added. 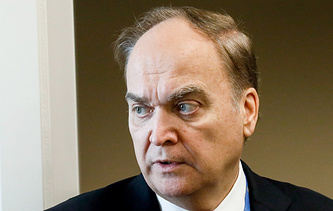 Antonov described the situation around the INF Treaty as "critical." "Russia did everything possible to save the INF Treaty. Our defense ministry proposed unprecedented trasparency measures that went beyond the treaty framework. We asked for a professional dialogue, without participation of the media," the diplomat said. He noted that Washington's steps show that the US planned to break down the INF Treaty from the start and did not have any intentions to reach a compromise with Russia on this issue. "All our proposals were turned down. It is obvious that a principled decision regarding the INF Treaty was made in Washington. They put forward unacceptable ultimatums, trying to level unfounded accusations against Russia of violating the conditions of the treaty," Antonov explained. 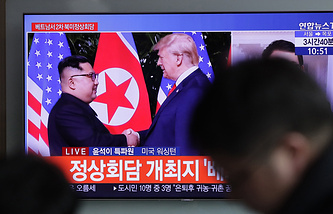 "With the break-down of this treaty, we are only left with the New START [Strategic Arms Reduction Treaty] whose prospects are also unclear," the diplomat continued. "We continue scrupulous everyday work with all officials who are ready to talk to us. We have established good contacts in the State Department, in the White House, in other departments," Antonov told TASS in an interview ahead of the Diplomats' Day. "We are working on ensuring uninterrupted functioning of Russia diplomatic missions in the US, we are trying to return seized Russian property. We are working with the faith that toxic Russophobic dust in Washington's air will disappear and common sense will prevail. We need to return to normal and pragmatic relations," the ambassador stressed. "Not only the well-being of our two countries, but the fate of the world depends on it," he added. Antonov reminded about multiple obstacles on the way of normal cooperation between Moscow and Washington, noting that "the situation in Russian-US relations remains complicated." "The year of 2018 can be described as the year of missed opportunities. Almost every day we experienced painful attacks at us which created additional difficulties for embassy's activities. 'The Russian factor' is present in domestic politics. We can say with confidence that this situation will persist," Antonov said. Moreover, US continues exerting "economic pressure on Russia," the ambassador continued. "[US] legislators are considering several additional draft laws to 'punish' Russia for 'the Skripal case', for helping Syria, for diversifying deliveries of Russian energy resources to European countries and many other 'sins'," the diplomat explained. Antonov said that "even Americans themselves admit that the current state of bilateral relations is very bad." "Our proposals on forming a joint agenda remain on the negotiations table. However, we will not beg or pursue anyone. We will wait patiently when people in Washington realize the importance of normal Russian-US relations," he concluded. "Talks between the presidents of Russia and the US are very important for Russian-US relations, for strengthening strategic stability and security. Of course, such meetings should be prepared, should bring real results. Our country does not want confrontation. Instead we support developing mutually beneficial, pragmatic relations. In this regard, contacts between the presidents are especially important now," Antonov said. The ambassador said that anti-Russian hysteria in the US seriously hampers organizing new summits between Russian President Vladimir Putin and US President Donald Trump. "The Russophobic atmosphere in Washington seriously hampers the development of Russian-US relations and negatively affects prospects for potential summits between the two leaders. However, we always stressed our resolve to work together in order to achieve concrete results," the diplomat noted. At the same time, "a lot depends on the US" and on their readiness to consider Russia's national interests, "to build equal mutual respectable relations," he continued. "It would be in the interests of the two countries to implement this approach in the nearest future, without any ties to particular dates and places, and without any preconditions or ultimatums. It is evident that such basic principles should serve as a foundation for preparatory work for contacts between our presidents," Antonov said.